There was a baseball game in Philadelphia tonight, but it was in name only. For, you see, it was less a game than a one-man pitching showcase, headlined by Cole Hamels and his nine shutout innings. His performance willed the Phillies to a victory over the Braves, 3-0, in a game where the runs scored will become a footnote to the deft performance Hamels put on display. – Tonight Cole Hamels reached a career milestone, starting his 100th game at Citizens Bank Park. Incidentally, it was also the first start at home for Hamels since he signed his new $144M deal with the Phillies on July 25. The new deal meant tonight’s game was the first of many to come for Hamels in south Philadelphia. If he can pitch in all of those the way he pitched tonight, he’ll have been worth every penny of that $144M (and possible $164M). Hamels was electrifying from start to finish, throwing a complete game shutout. He’d notch six strikeouts and walk none. – Hamels relied heavily on his fastball, sometimes throwing it five or six times in a row. The pitch hovered around 92-93 MPH, hit 94 MPH a few times, and was on the corners all night. The Braves would get just five baserunners against Hamels and none of them reached second base. 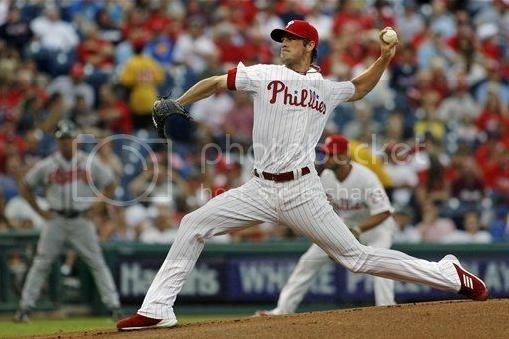 – It was a vintage performance in every way, and reaffirmed Hamels’s stature around baseball. You got a feeling early on that if the Phillies got a lead, Hamels could hold it. The victory tonight was Hamels’s first at home since June 15. He would be denied no longer. It was Hamels’s first complete game shutout of the year and the fifth of his career. – Mike Minor hasn’t been great this season, but he did pitch very well against the Phillies last time he faced them, throwing eight innings of shutout baseball a mere ten days ago. Tonight, he’d once again keep the Phils at bay, except for one hiccup. Minor was off early, and the Phils took advantage. Jimmy Rollins and Domonic Brown started the first with back-to-back doubles to make it 1-0. After a Chase Utley fly out, Ryan Howard padded the Phillies lead when he crushed a towering two-run home run to left center field. From there, Minor would settle in. But with the way Hamels was throwing, it wouldn’t matter. – Brown was a big part of the action tonight, driving in the first run and scoring the second. He’d also record his second outfield assist when he gunned down Brian McCann to end the fifth. – But he wasn’t perfect. On his double, he only reached second base safely because Martin Prado couldn’t handle the throw from the outfield. Then he failed to go back and tag on Utley’s fly ball with no outs. There’s nothing wrong with showing a little aggressiveness, but Brown needs to keep it going through the inning. His failure to tag didn’t cost the team a run this time–because Howard homered–but you’d still like to see a player with Brown’s speed make the fundamental play and get to third with one out. Hopefully he takes something away from that. – Still, Brown has looked very solid through his first week. He no longer wears the deer-in-headlights expression he had through 2010 and ’11. All the talk has been about how confident he is, and you can see it on the field. There’s a lot of room for growth, but Brown has handled his third stint in the majors with much more poise and adeptness than he had the first two times around. So far.